The Yankees were forced into a tough situation when spark plug Jacoby Ellsbury was forced to the disabled list with a knee sprain after Tuesday night’s game in Washington. Fortunately for the fans, the team didn’t just call up a random veteran to take Ellsbury’s spot on the roster. Instead, it was Scranton center fielder Slade Heathcott, a hard-nosed outfielder whose promotion was the end of a long and inspirational road to the majors. Heathcott was once on the 40-man roster but was cut during the off-season to clear space, a sign of just how far the 2009 first round pick had fallen in the Yankees’ eyes. Now, after a minor league career that has seen him go through extensive rehab for both injuries and alcohol, he has at last made it to The Show. Heathcott later added an infield single in the seventh, giving him a 2-for-3 night overall. In the long history of the Yankees, only 22 players had ever registered a multi-hit game in his first career start. It might not seem like much, but keep in mind how much pressure a young prospect must feel on such a big stage. Future stars Derek Jeter, Don Mattingly, and Robinson Cano all went hitless in their first starts. Amusingly, two of those aforementioned 22 games occurred last year, when now-Rakuten Golden Eagle Zelous Wheeler singled and homered in his big league debut on July 3rd and Heathcott’s current teammate Jose Pirela smacked a triple and a single on September 22nd. A similarly low number of Yankees had ever notched an extra-base hit in his first career start–just 23 in total. None had doubled since outfielder Justin Christian on June 24, 2008. Future Hall of Famers with hits in their first career starts: Yogi Berra, Joe DiMaggio, Mickey Mantle, Tony Lazzeri, and… two guys who made the Hall of Fame in another sport, George Halas and Deion Sanders. The most hits in a Yankees debut? That title belongs to none of those icons, but instead a random player from the 1930s named Russ Van Atta. On April 25, 1933 against the Washington Senators, Van Atta became one of just seven players in league history to kick off his career with a four-hit game thanks to four singles in a 16-0 blowout victory. In his seven-year career, Van Atta hit a dismal .228/.246/.306. The kicker? He was a pitcher. Speaking of pitchers, a tip of the cap to Chase Whitley, Brandon Claussen, Tyler Clippard, and the late Brad Halsey. None of these four players had swung a bat in years until forced into interleague action in National League parks for their first career starts. All got hits, and the future All-Star reliever Clippard even doubled! Someone please explain to me how lumbering first baseman Steve Balboni tripled in his debut. One can only assume that the outfielders all either fell down or peaced out on the game to go watch Wagner’s full Ring Cycle instead. Sure, there’s certainly a chance that Heathcott joins the ranks of forgotten names like Johnny Johnson, Vito Tamulis, Truck Hannah (all real people, I promise), who had fun debuts only to fizzle out shortly thereafter. 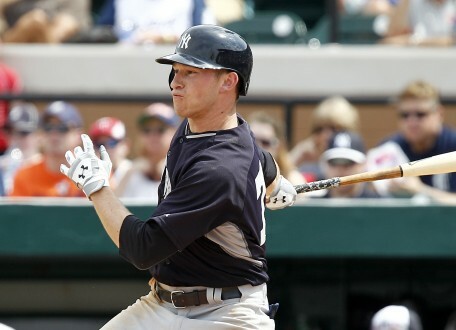 Nonetheless, Heathcott remains a fascinating prospect who will certainly be worth watching as he tries to build on his strong start going forward. It’s not every day that the Yankees get to infuse youth into their lineup, and until Ellsbury recovers, we will probably be seeing a decent amount of #SladeRunner. Best of luck to him. Writer and editor for Pinstripe Alley since 2012 and babbler of Yankees history since age 12. Aspires to keep his writer value higher than Andy Stankiewicz's baseball player value.